This charming boutique hotel is situated in the popular holiday resort of Sharm el Sheikh, just a 5-minute walk away from Mercato Street and Mercato Centre. The closest beach can be reached within 5 minutes by shuttle service, the international airport is 25 km away. The hotel features 100 rooms, 24-hour reception, express check-in and check-out, concierge service, currency exchange, WIFI, restaurant, 3 bars, outdoor and indoor pool, sports facilities, car hire and free on-site parking. Facilities for disabled guests. The hotel is located in the tourist resort of Sharm El Sheikh in the south of the Sinai peninsula. The air-conditioned beach hotel comprises a total of 70 rooms. The foyer of the club resort offers a 24-hour reception desk with a hotel safe and currency exchange, and a pub, disco and restaurant are available on site. Room and laundry services are also available for hotel guests. The fully furnished rooms come with an en suite bathroom, a hairdryer, a direct dial telephone, satellite TV, a mini fridge, a double or king-size bed, a hire safe, individually adjustable air conditioning and heating, as well as a balcony or terrace. A swimming pool with children's pool, sun loungers and parasols are all located in the outdoor complex. Sports enthusiasts can play beach volleyball and beach badminton and at least twice a week there are organised activities on the beach, such as belly dancing, folklore dance and oriental tanoura (drinks not included.) Sun loungers and parasols are available on the beach. Guests can select their breakfast, lunch and dinner from a buffet. It is possible to book an all-inclusive stay. The boutique 5-star Radisson Blu Resort Sharm El Sheikh is situated on the coast of the Sinai Peninsula, 8 km from Sharm El Sheikh International Airport. Its facilities include 3 tennis courts, 3 swimming pools, jogging tracks, a fitness centre, a spa with sauna, steam rooms, Jacuzzis, and massage centre, and a selection of bars and restaurants. Rooms are decorated in a modern style and feature free wifi, mini-bars and 24-hour room service. Experience a unique Red Sea holiday at Hilton Sharks Bay, one of the top hotels in Sharm el-Sheikh. Guests have everything at their fingertips at this all-inclusive resort, from professional vacation planners to poolside cocktail service and a private beach.Expect year-round sunny days, and Arabian nights with live entertainment and candle-lit Bedouin dinners. Host gatherings with a special twist, such as an exclusive boat trip, safari or circus show. Relax while the children meet new friends sliding down water slides or dancing at the mini-disco.Rooms and suites at Hilton Sharks Bay Resort are stylishly furnished, featuring balcony and terrace views of the pools, gardens or Red Sea. Opt for a diamond suite or Art Deco-style executive room for additional space and amenities.With more than 600 rooms and a selection of indoor and outdoor event spaces, Hilton Sharks Bay is an ideal destination for meetings and celebrations. The resort is a short drive from Sharm el-Sheikh International airport and Naama Bay shopping, with limousine and transportation services readily available. Special requests are welcome and VIP services are also accommodated.Whatever brings you to the Sharm el-Sheikh area, there are plenty of ways to unwind - tennis and mini golf, snorkeling and scuba diving, seven pools and 13 bars and restaurants. We look forward to welcoming you at Hilton Sharks Bay Resort. Located in Sharm el Sheikh (El Hadaba), Veraclub Queen Village is within a 10-minute drive of Naama Bay and Aqua Blue Water Park. 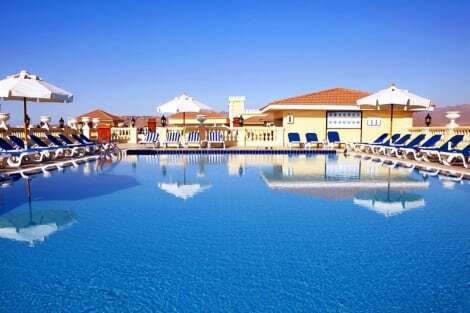 This 4-star hotel is 5.9 mi (9.6 km) from Naama Bay Beach and 7.9 mi (12.7 km) from Shark's Bay. Satisfy your appetite at IL Giardino Restaurant, one of the hotel's 3 restaurants. Relax with your favorite drink at the beach bar or the poolside bar. This hotel lies just 500 m from sandy Montazah Beach in Sharm El Sheikh in the south of the Sinau peninsula. It is around 14 km to the resort of Na'ama whilst the airport may be reached by car in about 10 minutes. Lying in a region of the Red Sea at the entrance to the Gulf of Aquaba with views of the Tiran Islands, the mild climate and diverse fishing and diving opportunities make this a particularly popular holiday destination. Winter temperatures are above 15 ºC on average. The rich marine life makes it one of the most spectacular reefs in the world, all of which lie just a few paces from the hotel. It is surrounded by extensive beaches such as those along the Bay of Naam. Facilities within the hotel include a foyer with a 24-hour reception desk, a currency exchange desk, public Internet access, the Sinai Lounge, the Restaurant Fayrouz, the Badia Bedouin tent, an amphitheatre, a hairdressing salon, a selection of shops, a children's playground and a kids' club. Three different types of rooms are available: standard double rooms for up to 3 adults or 2 adults and 3 children, rooms with sea views, which are the same size as the standard rooms, and family rooms that are suites with a bathroom, 1 bedroom and a lounge with a sofa bed and 1 extra bed. There is a swimming pool with a separate children's pool, a sun terrace with sun loungers and the Rosette pool bar as well as a beach bar to make use of in the outdoor complex. Further leisure offerings include a spa area with a Jacuzzi, Turkish baths, a massage service, a gym, water sports and aerobics courses. Table tennis and beach volleyball may also be played and there are daytime and evening entertainment programmes for guests both young and old. The hotel also has two beaches; one cut into the cliff down to the water with an access via a walkway to a dive site, the other is on the open round the corner. The hotel is very widely spread with lots of walking spaces, surrounded by exotic gardens. The reception of the hotel enjoys a water feature in the middle.Guests of the Dreams Beach Resort can easily visit the sister hotel Dreams Vacation, by using a little mini-bus going around the places. It is the perfect place to be for relaxing and enjoying a getaway from boisterous and animated daily life. Dreams Beach presents to its guests a variety of leisure facilities: animation Team performing shows and comedies, 5 swimming pools, 2 children, 2 heated in Winter and one for trainee divers, giant chess, tennis court, beach volley, water polo, water aerobics, fitness center , mini golf , football, billiards, diving center / diving College, Other services : disabled facilities / wheel chairs access, medical services, shopping area.The hotel provides a children's club and daytime and evening entertainment is also available. These rates are intended for use by European nationals. Other nationalities are subject to additional charges levied at the time of check in. The modern 4-star Park Inn By Radisson Sharm El Sheikh Resort is located by the Red Sea Riviera with 220 metres of private beach frontage overlooking Tiran Island. Its facilities include a water park with swimming pools and slides, a fitness centre, a spa with beauty treatments, steam rooms, and a heated Jacuzzi, Palms restaurant and the Pizzaria Snack Restaurant. Rooms are decorated in a modern style and feature satellite TVs and mini-bars. When you stay at Sierra Sharm El Sheikh - All-inclusive in Sharm el Sheikh, you'll be in a shopping district, a 1-minute drive from Shark's Bay and 9 minutes from Nabq Bay. This 4-star property is 11.6 mi (18.7 km) from Naama Bay and 3.3 mi (5.3 km) from SOHO Square. With a stay at Renaissance Sharm El Sheikh Golden View Beach Resort in Sharm el Sheikh (El Hadaba), you'll be a 1-minute drive from Hadaba Beach and 9 minutes from Sharm Old Town. 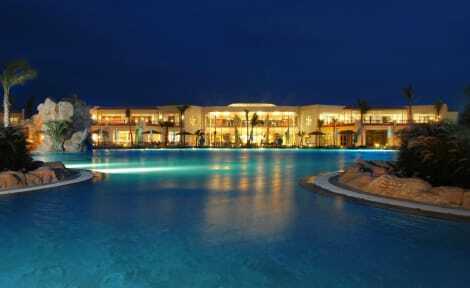 This 5-star resort is 6.4 mi (10.3 km) from Naama Bay Beach and 8.8 mi (14.1 km) from Hollywood Sharm El Sheikh. Dive into a Red Sea holiday at SHARM DREAMS RESORT, with its onsite diving center, casino and 9 pools (4 heated pools in winter). Kids will love the Kids' Club, and the water park and private beach are just 200 meters away. Located in Naama Bay, the resort is a haven for watersports. Dine alfresco Italian style at Casa Sharm restaurant or enjoy a poolside barbecue at the swim-up Pool Bar. Make use of the onsite fitness center and nearby tennis courts. For a range of watersports and other attractions, including camel rides.The Hilton Sharm Dreams Resort hotel has a meeting room for 16-220 with wireless internet access. Business facilities are available. From Hilton Guest Room to Junior Suite, all rooms have high-speed internet access. Upgrade to a Junior Suite for a patio with partial garden views. These rates are intended for use by European nationals. Other nationalities are subject to additional charges levied at the time of check in. lastminute.com has a fantastic range of hotels in Ras Nasrani, with everything from cheap hotels to luxurious five star accommodation available. We like to live up to our last minute name so remember you can book any one of our excellent Ras Nasrani hotels up until midnight and stay the same night.